Keeping an eye on you, originally uploaded by paul indigo. 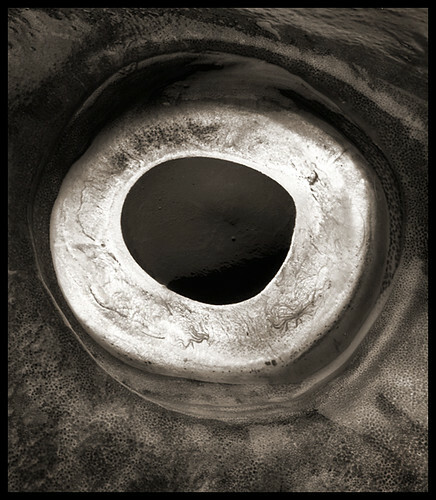 I photographed this fish eye in the studio using my Horseman 4x5 technical camera with a 6x9 film back on Fuji colour negative. The neg was then scanned and converted to black and white in Photoshop. It looked a bit grim in colour with the blood in the eye. This way it becomes more abstract. I used one overhead softbox with a Godard flash head. Luckily the job was completed relatively quickly and after opening the windows the smell of fresh fish soon left our studio. I know I've not been around for awhile now. I've been swamped with work. However, I'm ready to take up the blogosphere again and normal service will resume. I love this close-up shot of an eye. Whose eye is it?